Is it time to refresh your application delivery controller? Maybe your current box is end-of-life or you’re looking for more functionality or better price-per-performance? Or perhaps your application landscape has evolved and you’re examining ADC providers to help optimize app delivery, or to bridge your cloud and traditional on-premises application environments. There are a few key questions you should ask before you sign on the dotted line. 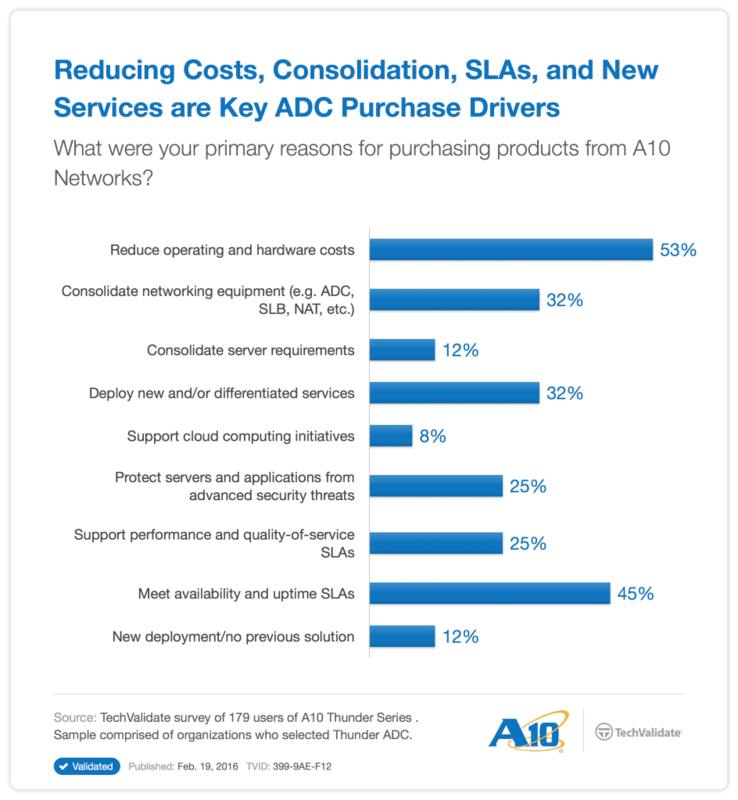 Here, we offer the 10 most important questions to ask an ADC provider before you buy. 1. Can I run all ADC features simultaneously? You wouldn’t buy a car if you couldn’t use every feature when you drive it. Imagine having to shut down the steering wheel to use stereo, or having to stop using the gas pedal in order to turn on the air conditioner. You wouldn’t feel like you got your money’s worth, and it’d be grossly inefficient. With A10, there are no limits on which ADC features you can run and when. Every A10 Thunder ADC model ships with and is able to concurrently run all advanced L4-7 networking and security features. And, you don’t have to buy more boxes to leverage all the features you need. You get L4-7 load balancing, SSL offload, caching, compression, authentication, Web and DNS application firewalls, and more. You can run every feature, all the time, with no limits. 2. What is the TCO? You deserve to know how much your ADC is going to cost you in the long run. You don’t need sneaky licensing fees and upgrades popping up at every turn to nickel and dime you. At A10, we’ve created a cost-effective solution for optimized application delivery. Every one of our Thunder ADC models comes with a predictable, all-inclusive software license, which includes all ADC features. And new features are made available to customers with a support contract. At the same time, our support earns high marks for service. We don’t push inflated consulting fees for routine support and service questions. On top of all that, you get an advanced, market-leading ADC with the most compact footprint, as well as low-power and cooling requirements, to support your corporate environmental policies. Our appliances offer the best performance per rack unit and the highest level “80 PLUS Platinum” certification for power supplies to ensure a green solution and reduce power consumption costs. And when it comes to cost per connection, we’ve proven ourselves to be most cost-effective. For example, in a mid-range matchup A10 was six times more fiscally sensible than other vendors at a cost-effective 5 cents per connection served versus their 30 cents per connection served. Talk about price per performance. What it all boils down to is that with A10, the initial quote you receive comes with no gimmicks and no hidden fees attached. And you get the best bang for the buck. With A10, you won’t suffer sticker shock (download our ROI white paper to learn more). 3. How do you support multi-tenancy? Modern applications demand speed and security. Users do as well. When it comes to ADCs, app delivery has to be optimized and secure, with few headaches. Often, companies are running hundreds of apps, each of which requires a specific set of policies. App-specific policies can be applied and tailored to individual applications to ensure that application performs the way you need them to. For example, some apps require an application firewall or a more specific security configuration to be applied, while some require L7 content-switching that can provide better levels of service to certain customers and use cases. Businesses need the granularity to provide app-specific ADC policies to most (if not all) of their applications and user groups. These policies must be tailored to each individual application, but having one ADC per app is not practical or feasible in certain environments. ADCs must support multi-tenancy and deliver the ability to have app-specific policies — it’s a must-have, not a nice to have. A10 Thunder ADCs offer 32 to over 1,000 (depending on the model) Application Delivery Partitions (ADPs) designed to support multi-tenancy. A10 provides the ultra-high density levels you demand for your applications and services. With A10, you can size your solution to meet user demands. ADPs deliver up to two orders of magnitude more partitioning than other ADC providers, and A10 can best optimize large numbers of individual apps for speed of delivery, security and availability. Many sites today run hundreds of apps, and even today’s virtualized servers can be armed with dozens of apps or more. ADPs let you slice and dice one ADC appliance into hundreds with no extra charge, and you can configure app-specific policies to more than 1,000 apps using a single appliance. This means you can optimize each app regardless of the others, which creates an environment that bucks the “one-size-fits-all” trend and ensures optimal delivery of apps and services. 4. Is the ADC easy to use? Ease of use and integration are huge factors in the purchasing decision. That’s why ADC products must be completely programmable and interoperate with other complementary infrastructure gear. Leveraging setup and configuration methods used by mainstream vendors makes devices easier to learn and deploy. Difficult-to-use APIs, or a CLI that is not intuitive and doesn’t adhere to industry norms, make operation all the more challenging and cumbersome; that can delay getting boxes up and running and require extra training for IT staff. That’s not the case with A10. A10’s Thunder ADCs have 100 percent programmability of all functions via its REST-based aXAPI, making remote interaction with third-party applications and tools a breeze and enabling snappier, dynamic configuration of all application network services with complete feature coverage. Our aXAPI is auto-generated with each release for full coverage, ensuring you always have the programmability options you need, eliminating the need to log a feature request. And our CLI closely mirrors the industry norm, meaning IT admins can get up to speed quickly. Additionally, our aFleX scripts ease policy generation and implementation with simple migration and conversion. With A10, you won’t stress about properly programming your appliances using our API and other third-party tools, and you won’t have to compromise on networking and security services when you develop a self-service portal or DevOps staff author tasks involving automation. 5. What’s your cloud strategy? The world is moving to the cloud, along with many of your applications. Your ADC vendor should have a finely-tuned cloud strategy that will help you bridge the physical and cloud-native worlds. This is especially true for service providers. 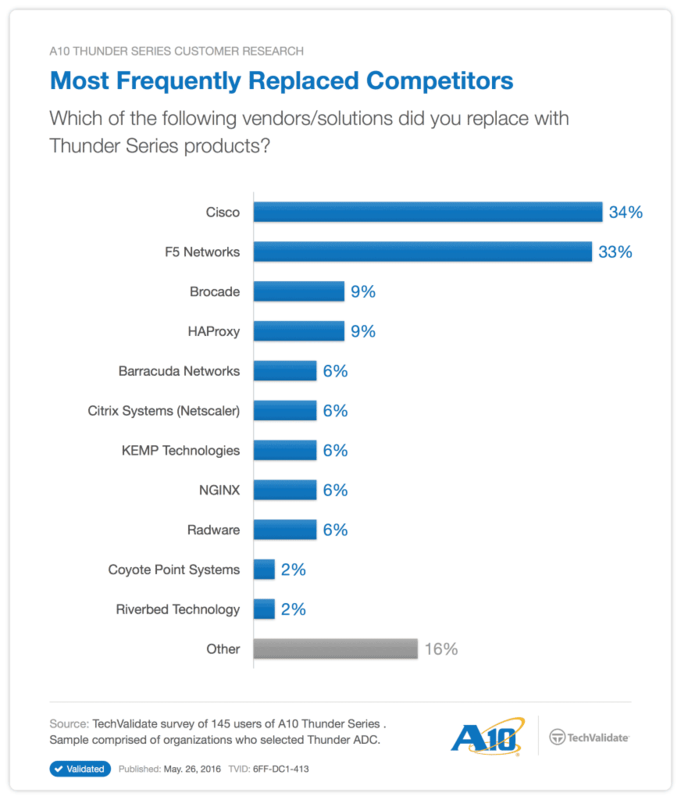 If your ADC vendor lacks solutions for cloud-native applications, multi-cloud environments and ADC-as-a-Service, are they the right partner to invest in for your business’s future? A10 recently made a major splash in the cloud with the acquisition of cloud application delivery provider Appcito, a move that enables secure application services that can help bridge your data centers and cloud environments. The Appcito acquisition expands the A10 Harmony solution options for secure application services across both public and private clouds, meaning you can deliver secure application services to all users — anywhere at any time. It’s a true industry first that provides unrivaled agility, making A10 the only cloud-ready and cloud-native ADC provider in the industry. Importantly, where your business pivots, your application services can pivot. 6. What sets your operating system apart? Modern applications require speed and agility. If your box is running a legacy operating system or one that hasn’t been updated or optimized in a few years, your apps may feel like they perform as if they’re running over dial-up. At A10, our Advanced Core Operating System (ACOS) platform was built from the ground up based on multi-core CPU designs, leveraged supercomputing principles and high-speed shared memory to meet rapidly growing application networking demands. Our operating system scales performance linearly in increasingly dense multicore CPU systems and consumes much fewer resources to achieve the similar capacity promised by traditional designs. That means you get a more efficient system that can deliver dramatic application and security performance improvements and can scale with greater value. Your end-users get a better experience — not just today, but in the future — and your IT budget can breathe a sigh of relief thanks to superior ROI with lower TCO. 7. How do your ADCs scale? There’s nothing more frustrating than a box that doesn’t scale. Don’t get burned by limited scaling, or by a forced upgrade or additional purchases to achieve the scalability your applications require. A10 offers maximum performance available with each model, including L7 HTTP and SSL processing with no costly license upgrades or associated penalties. Clustering with the aVCS (A10 Virtual Chassis System) feature is included and can deliver more than 1 Tbps of capacity; this enables a virtual chassis deployment that is more flexible and efficient than installing chassis and blades. With A10, your ADC scales with your business. 8. What do your customers say? Before you take the plunge and side with an ADC vendor, it’s imperative to learn about what their customer base thinks about them and their service. Due diligence requires close examination of case studies, reviews, and references. “With A10, we have been able to lower TCO and overall company alignment. The CLI and increased hardware performance has been of great value and benefit to us,” one engineer at a medium enterprise telecom services company said. 9. How stable is the executive leadership team? Turmoil and turnover in the executive ranks can directly impact customers. It impacts productivity, decisions, and product direction and availability. Changes in leadership can create dramatic shifts and unsettle partners and customers. At A10, founder and CEO Lee Chen is as involved as ever, and he has the support of a leadership team that shares his vision for A10 and its customers. 10. What’s in your trophy case? We don’t want to brag — OK, maybe we do a little — but we’ve won more than 15 tech awards in the past 7 years. Our trophy case is chock-full of some of the industry’s biggest awards. That’s a testament to our innovation and our service to our customers. This is another reason A10 replaces the legacy ADC vendors so frequently. An ADC refresh is no small thing. At A10, we want your refresh and purchase to be smooth and for you to be confident that you’ve made the right choice. Asking these 10 questions up front can help guide you to the right ADC provider and are ensure your business and applications receive the best secure application services now and in the future.